ISBN: 978-0-615-78061-0, perfect bound, 6×9, 130 pgs..
Sarah Jacobs was forty-seven when her marriage suddenly ended, forcing her to rebuild her personal, financial, and spiritual life from scratch. In one single afternoon, she was forced to make the jump from traditional Christian homemaker — raised to believe divorce was simply not an option — to a single woman struggling to find a job, some shelter, and her place in life. She didn’t know where she was going or how she was going to get there, but she did know that God was going with her. Now, years later, she is living proof that failure can be a launching pad to success.. 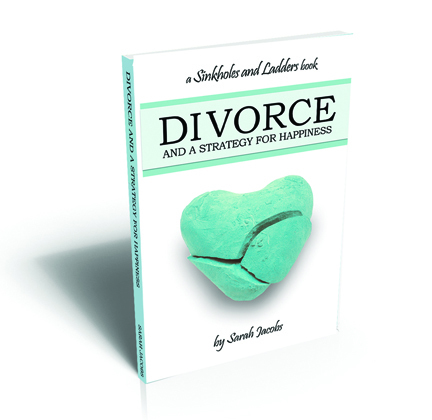 In Divorce and a Strategy for Happiness, Jacobs tackles the sticky areas that divorced believers find themselves in. Here, she shares her heart-wrenching story of isolation, how she overcame the realization of her deepest fears, and how you, too, can thrive during even the most unexpected parts of your own dark journey. Read an excerpt for free at the author’s website, www.sinkholesandladders.com.